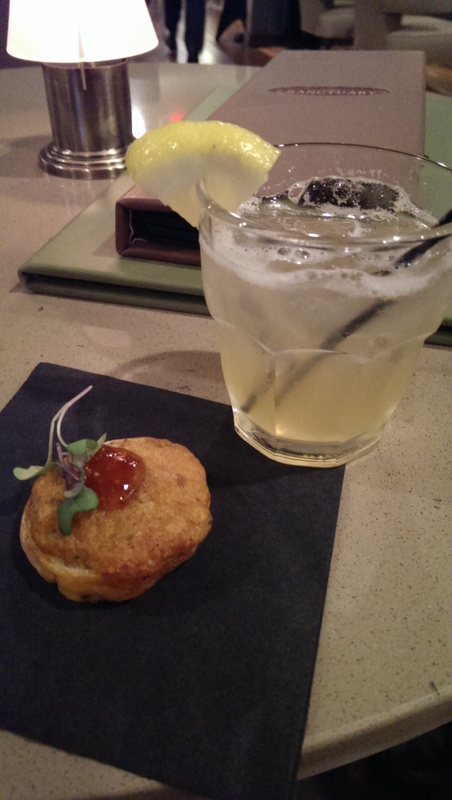 I was invited to Sanctuary’s media event Monday night before they opened on Tuesday, October 8th. Normally I turn down or ignore unsolicited publicity requests, but when I heard it was another venture by the Driftwood Group (aka Scott Kuhn and Chris Hodgson) I couldn’t say yes fast enough. Hotel food used to not have a good reputation until Amp 150 made it cool to have good food in a hotel. The Driftwood Group is not only taking over the old Capers and Porter’s locations, but they will be taking over all the hotel room service and catering. It makes me want to stay in the restaurant just to order room service! After walking into the hotel I was greeted by a long line of women bearing brochures. I checked in and was escorted into the Wine Bar, where I was offered a Beehive cocktail (their signature drink featuring Old Forester Bourbon, St. Elder Natural ElderFlower Liqueur, fresh lemon juice, ginger-honey syrup and soda – which was quite refreshing) and an upscale hanky-panky featuring chorizo sausage, Tillamook cheddar cheese and fig jam on a toasted crostini. The hanky-panky was nothing like the sausage and Velveeta cheese on rye bread squares I am used to. The chorizo gave it a nice little kick and the fig jam cooled down the heat. My second drink of the night was a Jack Lemmon. 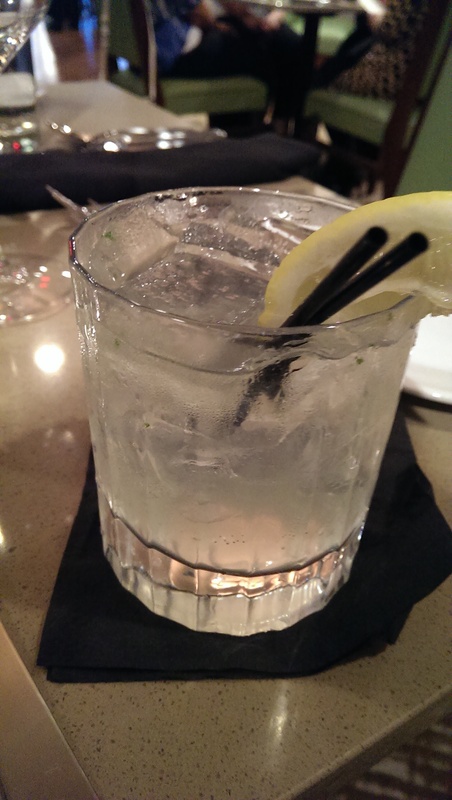 It features Caravella Limoncello, Plymouth Gin, Ginger, Mint, and Fever-Tree Bitter Lemon Soda. I love Bitter Lemon soda, which you don’t find here in the States that often. I had been wanting to try this cocktail since I saw it on the Cibrèo menu. The restaurant has brought some well-loved Driftwood favorites with them to the Beachwood location. It was delicious. I highly recommend you try it or one of the other many cocktails on the menu. We were then ushered to the next room for the meal portion of the evening. 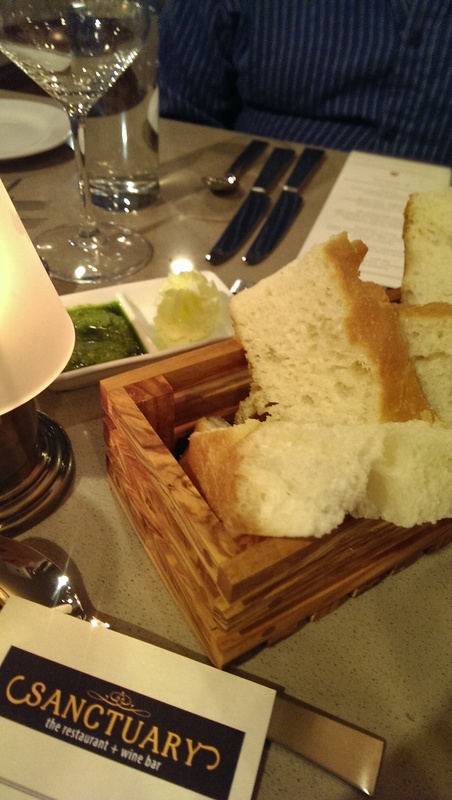 The bread service was brought to the table along with softened butter (yes! a restaurant that knows to serve butter that isn’t rock hard and tears the bread) and a nice pesto spread. I am not in love with the bread at Cibrèo, but I really liked this bread. I think it has a little more moisture to it, yet it holds up well to the spread. 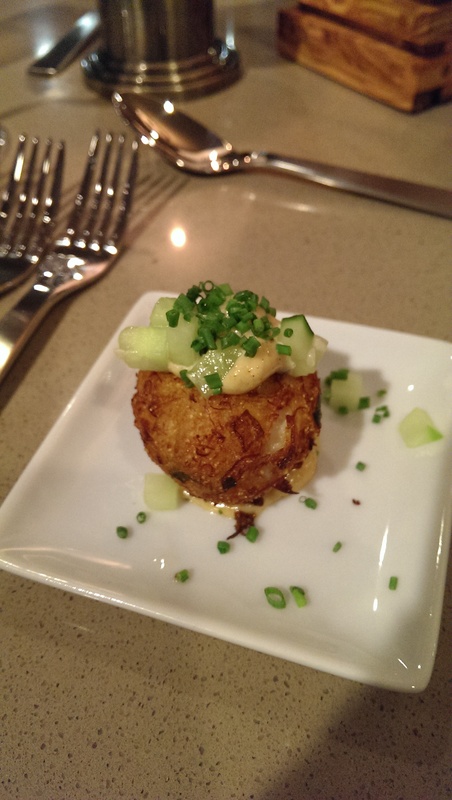 Our first course was a Blue Crab Hushpuppy, which was absolutely delicious. It was crispy on the outside and creamy on the inside with no trace of fishiness. The menu said it was made with blue crab and “Old Bayonnaise”. Well done, Chef Hodgson. I will definitely be ordering these appetizers when I dine here. 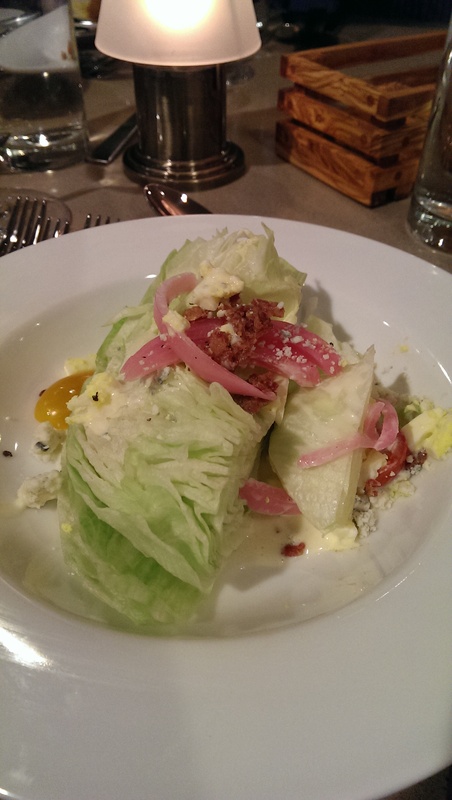 The next course was a Wedge Salad topped with cherry tomato halves, crumbled bacon, hard-boiled egg crumbles, picked red onion, a subtle blue cheese, and a light and delicious white French dressing. One of my dining companions joked that it was BLT wedge. In any event, I would definitely order this again as well. Next up was the Seared U-10 Sea Scallops over a risotto made of butternut squash, caramelized apples, fried sage and apple gastrique. The golden beets were crisped and served on the side of the scallops. It was billed as a gluten-free entree. 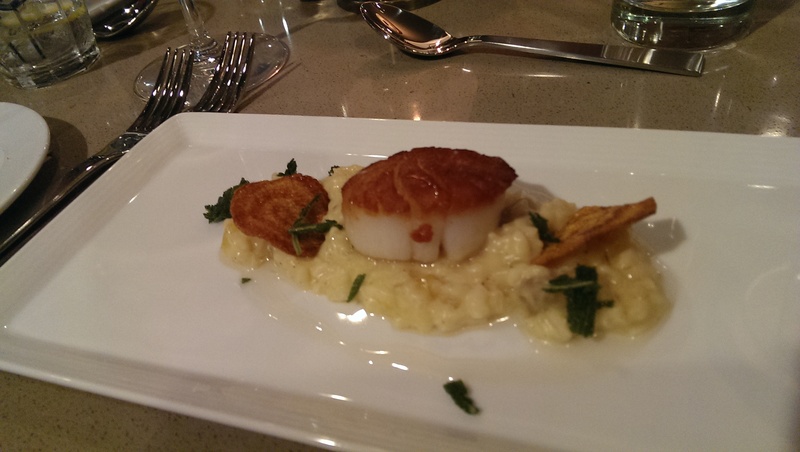 The scallop was perfectly seared and it paired well with the sweet risotto. Some people didn’t enjoy the risotto, but I did. They felt it was too sweet, but it paired well with the unseasoned scallop. The major course of the evening was the “C.A.B. 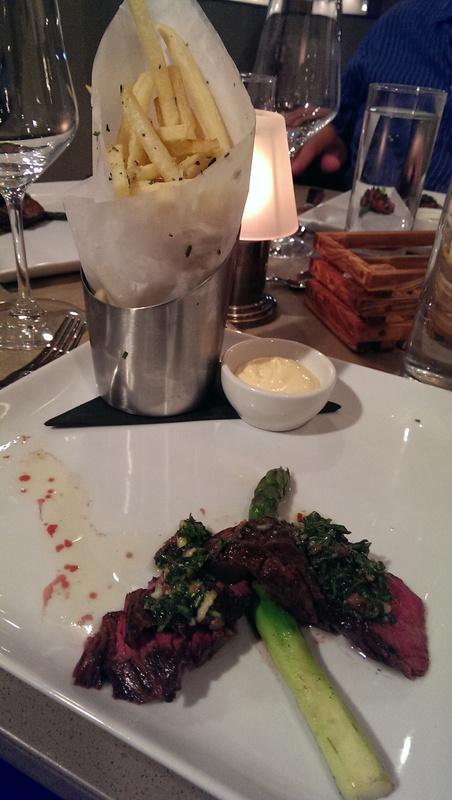 Hanger Steak” (C.A.B. being Certified Angus Beef) with shoestring potatoes. I loved the presentation of this course. The shoestring fries were served in a metal container with a parchment paper cone, and the steak was plated over an asparagus spear and topped with a salsa verde. The potatoes were perfectly seasoned and light and crisp on the outside yet creamy on the inside. The malt vinegar aioli reminded me of the mayo I dipped fries in Belgium into. The steak was perfectly cooked if you like a medium rare steak, which I do. It fell apart easily with just a fork. It was topped with a salsa verde that was somewhat overpowering and also managed to drip onto my shirt. I had done so well up until then! I was less impressed with the dessert course, but that might be because my diet has me completely off sugar and my tastes have changed. 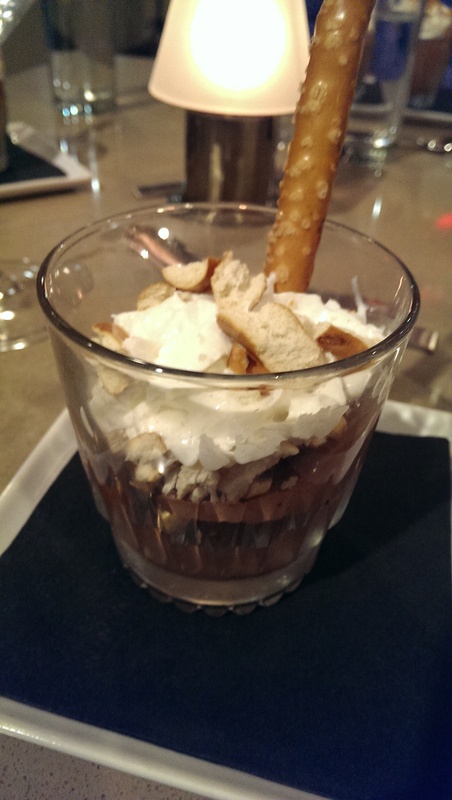 The Chocolate Mousse was light and fluffy and was topped with a salted caramel sauce, whipped cream and pretzel rod bits. It tasted like a chocolate covered pretzel, but the pretzel had soaked up a little moisture while it was waiting to be served and had become a little stale. Crystal at Eat*Drink*Cleveland questioned why the table was set with wine glasses when no wine was served. 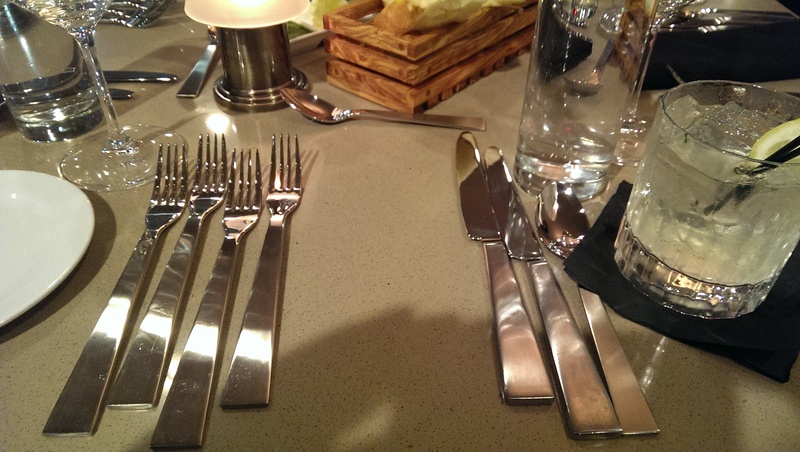 The table was beautifully set, but the glasses really should have been cleared away once it was determined no one would be using them. I also felt odd ordering a beverage when no beverage list was offered at the table, so once I finished my cocktail I stuck with water. 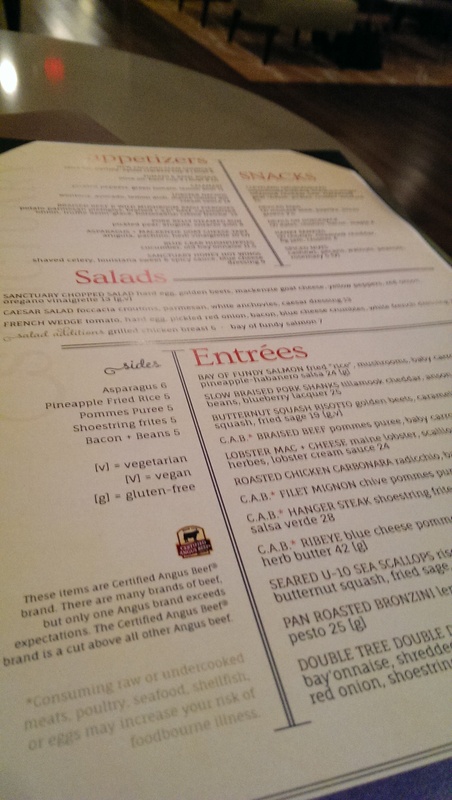 I can’t wait to go back and try some other things on the menu, like the Braised Beef & Wild Mushroom Ragu Pierogies, Veal And Shiitake Mushroom Meatloaf, and the DoubleTree Double Decker Burger. Sanctuary will offer lunch, happy hour and late-night fare and both a la carte breakfasts and DoubleTree’s signature breakfast buffet. I’m also a bit concerned that there might be some confusion with the name, Sanctuary, because there is already Sanctuary on Green in Beachwood. I guess time will tell. They plan to open a Sanctuary on the west side next year in the old Holiday Inn in Westlake. I wish them the best of luck, and I must say it is wonderful to have downtown quality in the suburbs with ample free parking available. 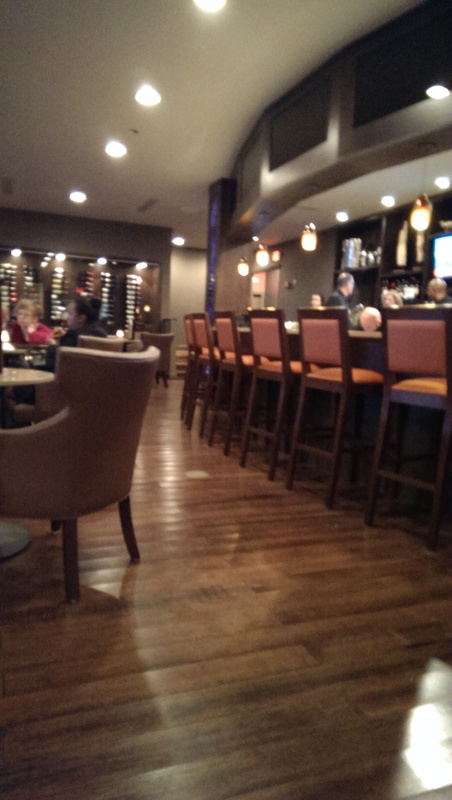 Disclosure: I was invited by the Driftwood Group to attend the Media Event. I was also given a $20 gift certificate to be applied toward a future visit. However, all opinions are my own.